Reverse a selection outline: Simply use the Invert command (or your program’s equivalent command). Add to a selection outline: To enlarge the selection outline, set the selection tool to an additive mode. You can then draw a new outline while retaining the existing one. 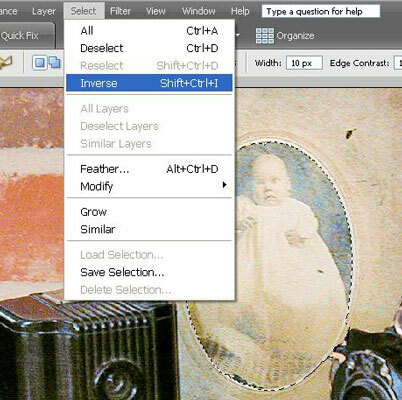 Shrink a selection outline: To deselect certain pixels currently enclosed in a selection outline, set the selection tool to a subtractive mode. The tool then works in reverse, deselecting rather than selecting. 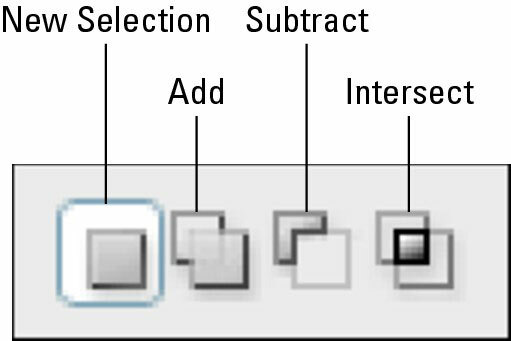 Intersect a selection outline: Some programs go even further, enabling you to create a selection outline that encompasses the area of overlap between an existing outline and a second outline. To set the selection tool mode in Elements, you can use these options bar buttons. Methods for switching selection tools modes vary widely from program to program. In some programs, you click a toolbar icon; in other programs, you press a key to toggle the additive and subtractive modes on and off.